Hungry to explore and support more of Portland's food artisan community, I spent much of this summer at farmers markets and food incubator events, meeting Portland's hardworking food artisans and eating their delicious, local, and sustainable creations. 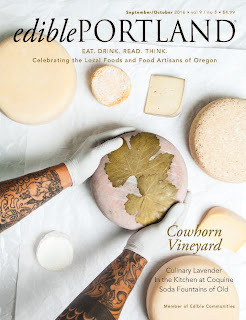 The result is three new articles in the relaunch issue of Edible Portland. 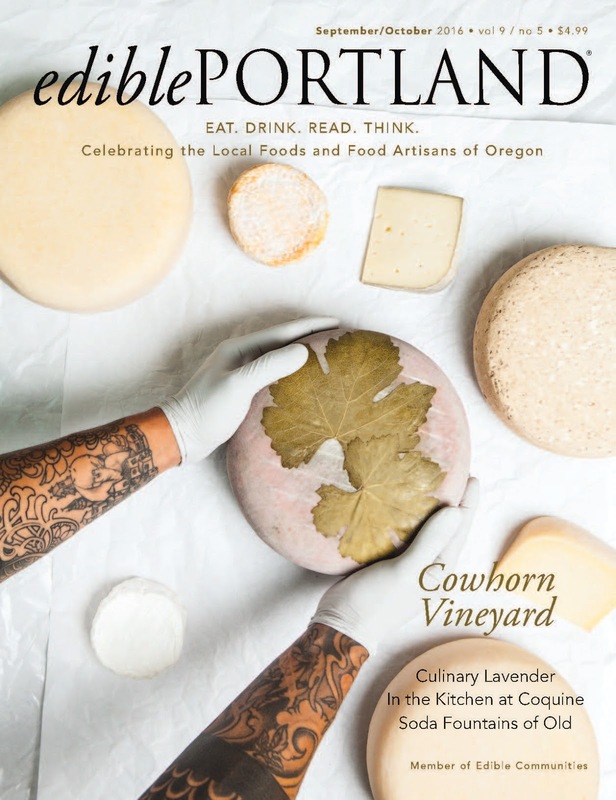 Formerly owned by Ecotrust, Edible Portland continues under Free Range Media and now comes out six times a year (read the full story of the acquisition here). 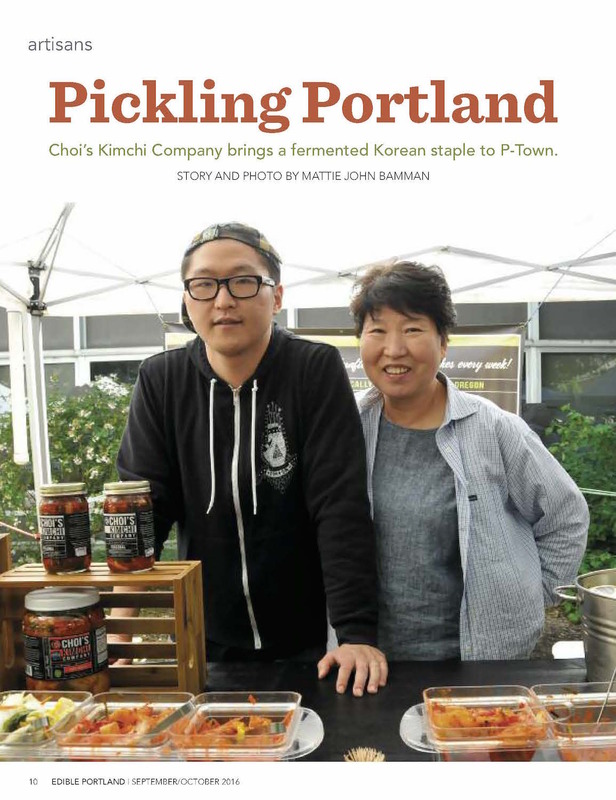 "Founded in 2011, Choi's Kimchi Company makes its kimchis using a generations-old family recipe by Chong Choi and her son Matt. "The earliest memory my mom always shares," says Matt," is the gimjang winter kimchi harvest in Korea. It's a really busy time, and she'd be running around helping and my grandmother would always have her taste the kimchi she was making and say, 'What does it need? Salt? More ginger?'" 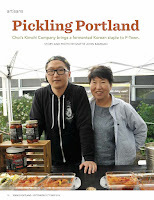 Immigrating to the United States when she was 25, Chong quickly earned a reputation in her community for making great kimchi, whether for friends or family or church events..."
Portland's only urban creamery churns out award-winning cheese — with nary a cow in sight. 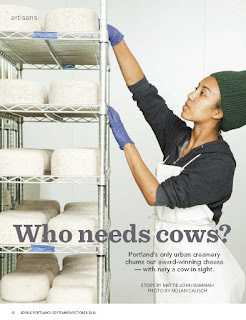 "Walking down the sidewalk in inner Southeast Portland, you may glance through a window and suddenly find yourself face to face with men and women in hair nets, white aprons, and rubber boots wielding hundreds of pounds of freshly made cheese. Without a cow in sight, Ancient Heritage Dairy opened Portland's only urban creamery in spring 2015, but if you speak with the Obringer family that owns the creamery, they'll say they're just carrying on tradition..."
Relax! Ease into these classic drink recipes. 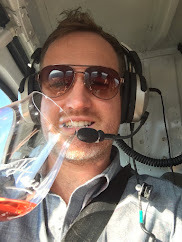 "Are you perhaps healthily obsessed with craft cocktails? Do you wish you could whip them up without finding and buying all manner of esoteric ingredient and liqueur? 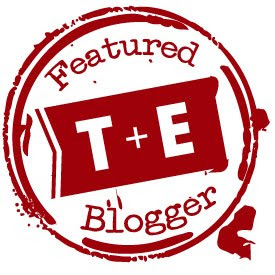 Genevieve Brazelton had the same thoughts exactly, so in 2012 she and her husband founded The Bitter Housewife, a line of cocktail bitters specifically designed to give depth to classic drink recipes, one dash at a time. 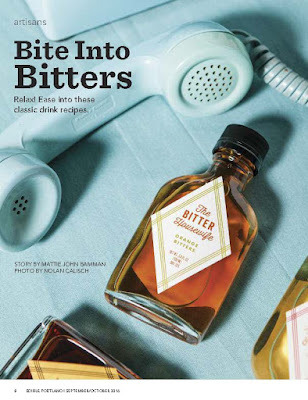 Bitters are still classified as a form of medicine in Oregon, which makes sense, if craft cocktails are the cure for what ails you. In its new, expanded Northeast workshop, The Bitter Housewife makes bitters by infusing high-proof spirits with Genevieve's signature flavor profiles. Her Aromatic Bitters, for instance, features bourbon infused with 17 botanicals. The result is a local take on Angostura bitters, the ubiquitous bitters used in drinks like old fashioneds and Vieux Carres..."